Polikarpov's design signature during the mid and late 1930s was stubby, barrel-shaped fighters. The primary machine during that era was the I-15 biplane. Like their barrel-shaped brothers on the other side of the world, the Grumman F3Fs, the I-15 was going to be transformed almost directly into a monoplane fighter, the I-16. In the transformation, the I-15's upper wing was deleted and the lower wing strengthened to carry the full load. With a wingspan one meter shorter than the I-15, the early I-16 was powered by the same 700hp M-25 radial engine as the late-model I-15. The I-16 also incorporated retractable landing gear which could be exchanged for retractable skis. Armament for the I-16 Type 104 was a pair of 7.62mm machine guns in the top of the nose and another pair in the wings just outside the propeller arc. The Type 17 retained the nose-mounted machine guns, while the wing-mounted guns were replaced with 20mm cannons. The I-16 saw combat on two fronts in the late 1930s, first in the Spanish Civil War and later with the Chinese against Japan. In Spain, the early Bf 109s flown by the Nationalists were surprised by the agile I-16 and suffered losses to the 'Rata' (Rat) as they nicknamed it. The Japanese forces were also surprised by the agile I-16 until they finally discovered and exploited the I-16's weaknesses. By 1941, the Type 24 had become the primary version in service featuring a more powerful engine, standard radio equipment, and strengthened landing gear. This became the main production version of the I-16 and was later updated to the Type 29 briefly before being removed from service. 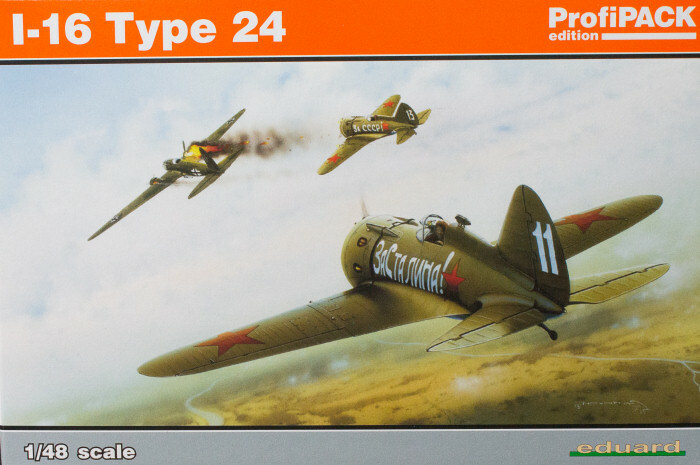 Eduard first released this kit in 2006 and it remains the best I-16 kit in 1/48 scale. The kit is molded in gray styrene and presented on four parts trees, plus a tiny clear stub containing the windscreen. The kit is rounded out with a set of color-printed photo-etched parts. While the kit has a positionable rudder, the elevators are molded in the neutral position on the horizontal stabilizers and likewise for the ailerons on the wings. If you want to position them other than neutral, careful surgery will be required. This is a beautiful kit with excellent details throughout. This kit remains the nicest I-16 available in 1/48 scale. What's more, Eduard released this reissue with the 2006 MSRP of about $30.00 USD. Nice!